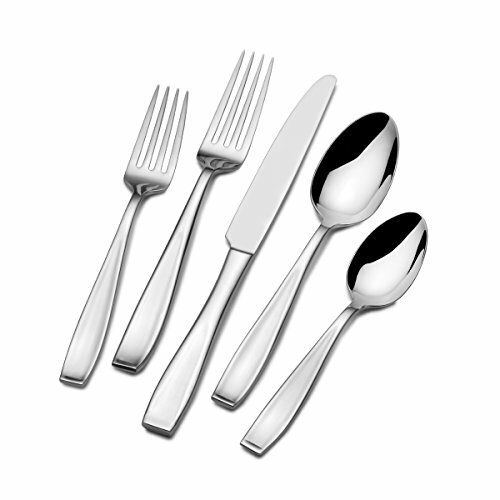 Bring a touch of elegance to the dining table with the Mikasa Natasha 65 Piece Flatware Set. Serve family and friends with a complete place setting for any dining event. This heavyweight flatware features handles with a distinctive shape and bold styling that will add casual luxury to any dining experience. 65-piece set with service for 12 includes 12 each of salad forks, dinner forks, dinner knives, dinner spoons, and teaspoons with a 5-piece serving set that includes a tablespoon, cold meat fork, pierced tablespoon, sugar spoon, and butter knife. Thanks to 18/0 stainless steel, this set stands up to the rigors of everyday use, and never needs polishing. Every piece in the set is dishwasher safe for easy and quick cleanup. short handles I like the weight, the look, but the handles are shorter than normal, so it feels weird, especially the salad fork. It has a nice feel, not too heavy Gorgeous silverware. Purchased as a gift for my parents. It has a nice feel, not too heavy, smooth finish. Feels sophisticated, like what you’d find in an upscale restaurant.